Nearly four weeks into the National Hockey League season, it’s the time general managers make key decisions on keeping prized young prospects or returning them to their junior hockey teams. This so-called “slide rule’’ impacts our state’s four major junior hockey programs — including the local Seattle Thunderbirds and Everett Silvertips – within the Western Hockey League (WHL) and broader Canadian Hockey League (CHL) system. Effectively, an NHL team can play a CHL-eligible player for up to nine games and return him to his prior junior team without using up a year on his salary-cap-friendly entry-level contract. The rule was enacted 40 years ago when the NHL bumped its minimum draft-eligible age from 20 down to 18. To keep from decimating junior rosters of top teenage talent, the slide-rule allows for CHL teams to have their 18- and 19-year-old draftees returned fairly early on in the season if they aren’t quite NHL ready. NHL teams can still keep them 10 or more games and return them to junior as well. But that costs one of the three years on a player’s entry-level deal – where salaries max out at $925,000 — so keeping them a few games beyond the limit usually isn’t worthwhile. Things are different with 20-year-old players, who can either be sent back to junior or to the minor professional American Hockey League (AHL) or ECHL. NHL teams typically prefer their prospects seasoned with other pros as opposed to going back and dominating their junior leagues again, but exceptions still do happen. Anyhow, this is ultimately the final step in whether top young teenage picks can make a direct NHL jump. And when they don’t, it can be very rewarding to the junior teams that get those players back. The U.S. Division of the WHL – featuring the Washington teams and Portland Winterhawks – appears up for grabs thus far, and the Spokane Chiefs and Tri-City Americans could be solid slide-rule beneficiaries. The Chiefs last week had center Jaret Anderson-Dolan, 19, returned by the Los Angeles Kings after he’d notched one assist in five NHL games. Anderson-Dolan was immediately named a Chiefs co-captain and sets an already-competitive Spokane team up nicely. Kings coach John Stevens seemed to suggest to reporters the front office sent Anderson-Dolan back because the team’s slumping start to the season wasn’t conducive to developing a player already showing signs he was NHL ready. Regardless, the demotion is great news for the Chiefs, who had been working to overcome the loss of four key offensive players – most-notably top Edmonton Oilers prospect Kailer Yamamoto – so getting back a guy who had 79 goals the past two seasons certainly helps. As for Yamamoto, the Spokane native drafted 22nd overall by the Oilers in 2017, he scored his first NHL goal last week and has now been moved to that team’s top scoring line alongside Connor McDavid. The Oilers last year kept Yamamoto for nine games and then returned him to the Chiefs, where he scored 21 goals and added 43 assists in just 40 games. This year, Yamamoto, who had appeared in nine NHL contests as of Saturday, could again be sent down – only it would likely be to the Oilers’ AHL farm club in Bakersfield, Calif., instead of the Chiefs because he turned 20 in September. The Tri-City squad is now eyeing what’s going on with Detroit Red Wings center Michael Rasmussen, 19, who as of Sunday had one assist in nine contests for a team losing just as much as the Kings. Reports out of Detroit last week were that Rasmussen, who had 31 goals and 28 assists for the Americans last season, would be auditioned beyond 10 games and have a year of his entry-level deal burned before the Red Wings ultimately make a decision. Two years ago, some NHL returnees helped swing the balance of power in the entire WHL. The Thunderbirds were slogging along at a .500 pace when they had winger Ryan Gropp surprisingly returned to them by the New York Rangers – and as a 20-year-old at that – just weeks before the New York Islanders returned center Mathew Barzal. The T-birds took off from there, demolished all comers in the playoffs and won their first-ever WHL championship. These days, Barzal is coming off a Rookie of the Year campaign for the Islanders, while Gropp is in his second year with the Rangers’ AHL affiliate in Hartford after a strong debut for them last season. There are no such instant championship panaceas awaiting local squads this season. 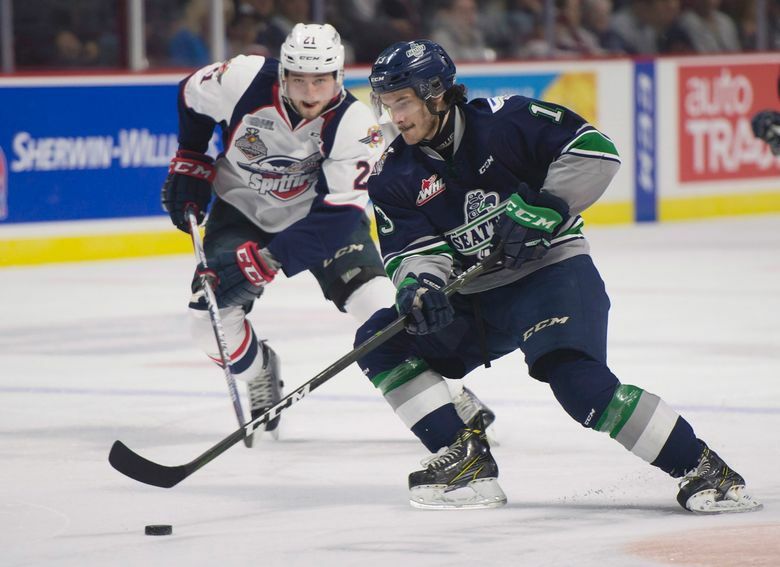 The Thunderbirds had plenty of supporting title pieces already in place before Barzal and Gropp were returned and had made the league final the prior year. The defending U.S. Division and conference champion Silvertips, beaten in the WHL final last season, don’t have any teenagers that must be returned. The Silvertips, who have a strong chance of repeating as division winners, do have three 20-year-olds who technically could still be sent back — most notably, goaltending phenom Carter Hart of the Philadelphia Flyers. But Hart is now with Philadelphia’s AHL affiliate. Forward Garrett Pilon is with the Washington Capitals’ AHL team while defenseman Ondrej Vala was sent to the ECHL by the Dallas Stars. They would all have to be severely overmatched playing with those clubs for Everett to get another sniff. So, it remains to be seen whether the Americans can count on any Rasmussen help this year. And whether the return of Anderson-Dolan to the Chiefs can again help tilt the results in what’s been a competitive local junior season thus far.